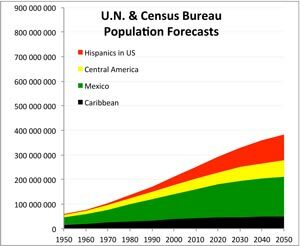 In the neighboring regions, however, from which America has traditionally been inundated with immigrants”the Caribbean, Mexico, and Central America”the U.N.’s best guess is that population will stabilize in the second half of this century. So America’s future doesn”t look quite as daunting as Europe’s. We have to hang on for another 35 years or so, whereas Europe can”t afford to slip up over the next 85 years. 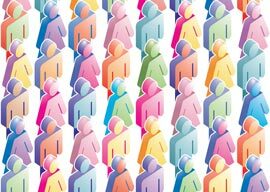 Still, the U.S. Census Bureau is assuming a continuing immense expansion in the Hispanic population resident in America, from 57 million already to 106 million in 2050. So if you are a European dreaming of someday visiting America, book soon, before the U.S. as a whole looks like Fresno. 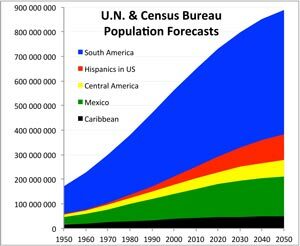 I”m not in the business of making specific forecasts, but let me offer a general concern: There are currently 418 million people in South America, and the U.N. says there will be 510 million by midcentury. What are the odds that at some point something will go wrong in Latin America that interested parties in the U.S. will try to define as justifying our own Camp of the Saints? Last year, the Obama administration tried to pass off Central American gang violence as justification for letting in unaccompanied youths. Next year, it could be an earthquake, hurricane, civil strife, recession, inflation, sexism, homophobia, or transgender insensitivity. And for that matter, if the population of Africa keeps doubling”because encouraging Africans to show some restraint and responsibility is racist”what’s to stop a flash mob from coming from Africa? Sure, it sounds implausible today with Africans currently flocking toward Italy, but keep in mind that Australia had boat people coming all the way from Sri Lanka in the Indian Ocean, which is as far from Darwin, Australia, as Dakar, Senegal, is from New York. While these graphs may seem daunting, note that the small country of Israel has largely sidestepped the surges endangering the rest of the wealthy white world because its leadership has the foresight and will to take precautions. The latest debate in Israel is not over how many Muslims to let in, but over whether Israel’s high Jewish birthrate is ecologically sustainable. First, any asylum seekers who show up in America uninvited should be immediately flown to a safe haven where their application and the authenticity of their documents can be investigated thoroughly. I”d nominate the U.S. military’s Soto Cano Air Base in Honduras, where a hygienic tent city could be set up on its 12 square miles of fenced-in grounds. Authentic refugees would appreciate the security of being protected by the world’s strongest military, while the usual crowd of fraudsters would be discouraged by finding themselves right back in a banana republic, 1,525 miles from the Texas border. Second, use social media. These are not particularly formidable people who are trying to overwhelm us. They tend to be superstitious”Arabs, for example, are often freaked out by a dog, especially a black dog“and easily spooked by evidence that they aren”t welcome. Third, provide visual evidence for social media that flash mobs aren”t welcome, such as nonviolent demonstrations. Last year’s peaceful protests by American citizens in Murrieta, Calif., had impact. Set a concrete limit on the total number of immigrants that will be allowed into the US per year. Make it known that “migrants” and “refugees” will count as part of that number, thus reducing visas and opportunities for everyone else’s favorite race or interest group. The point of this is to use divide-and-conquer strategies to set ethnic lobbies in the U.S. battling one another over a finite pie, instead of the present policy of encouraging everybody to rhetorically gang up on straight white men as the source of all evil. This policy would incite the Muslims to point out why America would be nuts to let in more Hispanics, and vice versa. If applicants are denied refugee status and their home country refuses to accept them back, stop issuing any visas for that country. Even the elites who don”t want to emigrate here will hate the idea of not being able to send their kids to school in the US, or make the occasional luxury shopping spree trip. Much of the Mexican ruling class, for instance, is vulnerable to being denied visas to visit the luxury homes they”ve corruptly acquired in Texas, Florida, and New York. Trump Tower, for instance, is likely home to Mexican elites who could be pressured into cooperating with American border protection the way Egypt and Jordan cooperate with Israel. Sixth, and most of all, the U.S., like other Western democracies, needs new elites. While there is quite a bit that patriotic citizens can self-organize to accomplish in their own defense, nothing compares to the luxury that Israelis enjoy: a government that is on the side of its democratic majority.